If you are planning to begin service with Perennial, you can complete an application in our office or download a Residential Application or Commercial Application online. You will need the latest version of Adobe Reader to view our forms. A meter deposit in the amount of $200 shall be required from all customers, unless the customer has established satisfactory credit history with the District, or the District receives an acceptable letter of credit from the customer’s previous power supplier. If a previously paid deposit has been refunded or is determined to be inadequate, a new or additional deposit in the amount equal to two times the customer’s highest monthly bill during the last 12 months, may be required upon (10) days written notice. All meter deposits will be applied to the customer’s account after one (1) year of service, or one (1) year from the last Disconnect Notice. New commercial and industrial customers shall provide a prepayment equal to two month’s estimated revenue, but not less than $200. The prepayment is nonrefundable, will not accrue interest and will be applied to the customer’s final bill. • A surety Bond approved by the District’s legal counsel. • An Irrevocable Letter of Credit from the customer’s bank equal to two month’s estimated revenue. The customer is required to maintain such Letter of Credit until the District has determined such customer has demonstrated good payment history and the customer’s financial condition has been determined by the District to be adequate for payment of future bills. •Any other type of security arrangement approved by the District. • If a commercial or industrial account becomes delinquent and the District does not hold any security as described in this policy, the customer shall provide the District such security within 10 days of the delinquency notice. Failure to provide security within this timeframe shall result in the service being subject to disconnection. Perennial offers Automatic Bank Draft service for those who wish to have their bills automatically paid from their bank account each month. 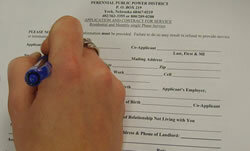 You can download an Automatic Bank Draft form here or fill one out at our office.